Nicknamed “the rock stars of the ocean” because they live fast and die young, cuttlefish have a lifespan of only 12-18 months, so impressive displays are necessary to attract a mate without delay. EACH YEAR MORE THAN 100,000 bizarre creatures gather in South Australia’s Upper Spencer Gulf Marine Park in what is the only known mass aggregation of its kind in the world. Nicknamed “the rock stars of the ocean” because they live fast and die young, cuttlefish have a life-span of only 12-18 months. This makes each May-to-August breeding season critical, because the number of surviving eggs in one year directly affects the number of adult cuttlefish that return the next year to breed. Favourable conditions and a series of law changes, such as fishing bans, have helped the cuttlefish recover from a population of 13,000 in 2013 to 120,000 in 2017. The 2018 count has yet to be finalised but local experts predict the figure to be higher than last year. About a third of the five-mile strip of rocky reef where the cuttlefish lay their eggs has been a marine-park sanctuary since 2014. The reef is at Point Lowly in the Spencer Gulf, some 12 miles east of Whyalla and almost 250 miles from the South Australian capital Adelaide. 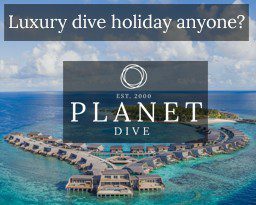 Organised community dives have been run for the past three seasons, attracting hundreds of visitors from around Australia and overseas. 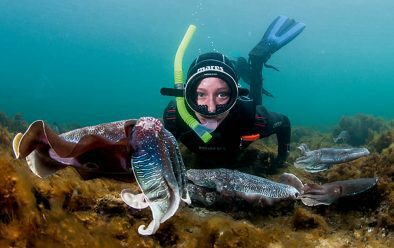 Natural Resources Eyre Peninsula Marine Parks Co-ordinator Dr Shelley Paull says that recorded cuttlefish numbers peaked in the late 1990s at about 200,000 but declined because of a number of factors, including over-fishing and fluctuating water temperatures. She says that Upper Spencer Gulf is typically made up of mangroves, sandy bottoms and seagrass beds, making the uncommon habitat of rocky reef around Point Lowly a natural drawcard for the cuttlefish. “The boulders are ideal for them to place their eggs underneath, and that’s why they head there every year because the habitat, salinity and temperature are perfect for them,” says Dr Paull. “They get there when the water is really cold, and as the temperature increases as we get towards spring the cuttlefish babies start to form. 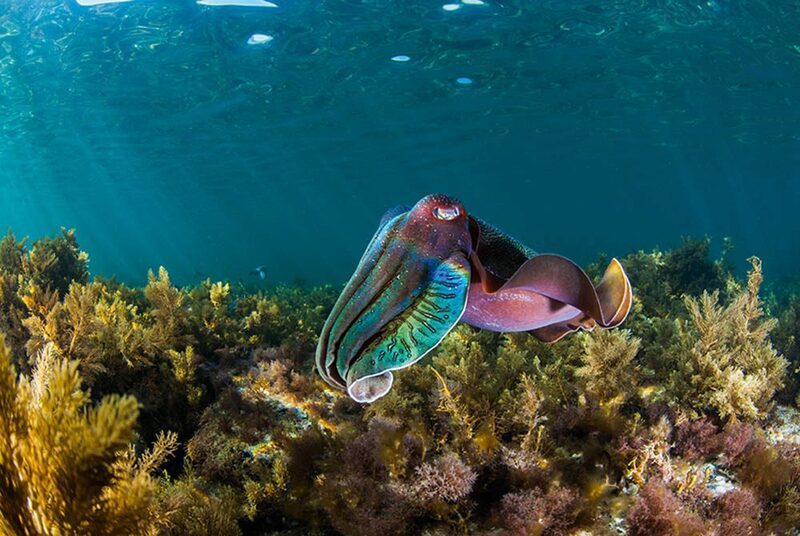 Giant Australian cuttlefish (Sepia apama) are found all along the southern Australian coast in waters off Western Australia, South Australia, Victoria and New South Wales. However, Dr Paull says that the cuttlefish in South Australia’s Upper Spencer Gulf have slightly different genetics from those found in other areas, so we know that those aggregating in the gulf don’t breed and rarely mix with those further south. ALSO KNOWN AS the chameleons of the sea, cuttlefish’s chromatophore skin-cells allow them to change colour and texture within a second from blues to greens to purples and black, to help them hide from predators, ambush prey and attract a mate. Dr Paull says that male cuttlefish flash different colours in “dance battles” to win the attention of a female, and that other less-formidable males use their colour-changing abilities to pretend to be female, in an effort to trick the larger males and steal their mate. “The boys do a kind of dance-off when they’re trying to fight for a female, and they will shimmer black and white colours up and down their bodies. “The big males can be up to 5kg, and they fight each other and do this dance-off to determine who gets to mate with the female, but the little boys don’t have the size to fight, so they have this behaviour where they pretend to be a female. “They change their colour and they pull their arms in so they look quite small. 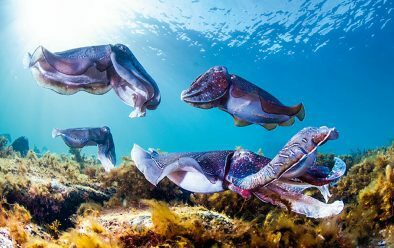 Each year more than 100,000 giant cuttlefish gather in South Australia’s Upper Spencer Gulf Marine Park in what is the only known mass aggregation of its kind in the world. The Spencer Gulf region of South Australia is known for pristine waters and premium seafood including prawns, oysters, tuna and kingfish. But the cuttlefish, which have been off the menu in Upper Spencer Gulf since 2013, are starting to bring other economic benefits to the area. Whyalla is South Australia’s third-largest city and is best known for its steel production. It is still recovering from an economic downturn that has marred the region for the past decade. In recent months visitor numbers have skyrocketed as tourists come from far and wide to dive with the cuttlefish. The Whyalla visitor information centre has seen a significant increase in foot traffic, and snorkelling tours run by Experiencing Marine Sanctuaries attracted 540 participants across just two weekends this July. This was on top of the hundreds of divers who took to the water on private tours or on unguided dives using their own equipment. THE INAUGURAL CuttleFest was held to celebrate the globally unique aggregation and to educate visitors about the marine environment. 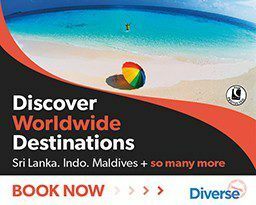 “There are more and more people every year and it’s so accessible – all you have to do is have the right gear and you can just walk into the water and snorkel around,” says Dr Paull. 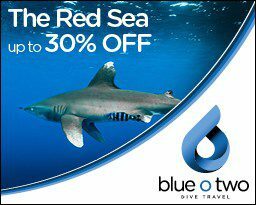 “A lot of the people who participate in our guided tours are first-time or inexperienced snorkellers, so they can be a bit apprehensive but it opens up a whole new world for them – they squeal through their snorkels and they come out with these massive smiles and a new appreciation for the ocean world. The Whyalla visitor information centre has seen a significant increase in visitors who have come to dive or snorkel with the cuttlefish. 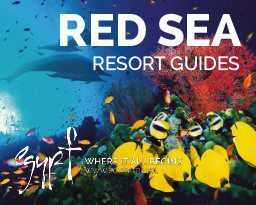 Experiencing Marine Sanctuaries co-founder Carl Charter came up with the CuttleFest concept, which it ran in conjunction with Natural Resources Eyre Peninsula Marine Parks. Charter has been diving for about 35 years and said swimming with the cuttlefish was one of the most unusual experiences. 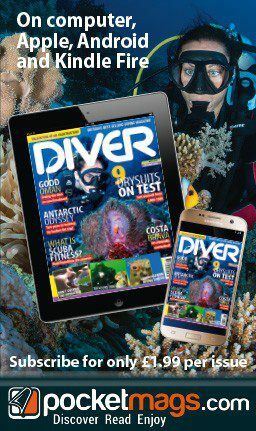 He has also filmed 360° underwater footage of the cuttlefish to be used for marine education and viewed through virtual-reality goggles. Dr Paull says that while education would play a significant role in maintaining cuttlefish numbers in the area, there are no guarantees that they would continue to thrive.